The average working life of a UPS system is about 10 years. This does depend on how well maintained the uninterruptible power supply was during its lifetime but even so components and wiring can start to show signs of degradation. During its working life a UPS will typically have one or two battery changes. For a five-year design life Valve Regulated Lead Acid (VRLA) battery, the replacement battery was probably fitted around years 3-4. For a ten-year design life battery, replacement batteries should be considered around years 7-8. Other problems can be experienced with an ageing UPS system. As a UPS ages, its electrolytic capacitors can start to dry out. Fans can also start to show signs of wear and tear. Internal cabling and connection can age. Nearly all of these are temperature, voltage and current usage dependent. 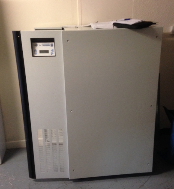 The costs to complete an overhaul of a 10year old uninterruptible power supply can be high. When you factor in other advancements a replacement UPS system becomes very attractive. During a ten year period you UPS will develop rapidly in terms of power technology, energy efficiency and volumetric and footprint shrinkage. In addition most organisations write-off balance sheet investments in critical power systems like UPS and generators over a ten-year period. At EcoPowerSupplies we make the upgrade path very easy. We are often called to survey an existing installation and recommend an upgrade path. The process is routine for us and involves a complete site review. In terms of being as environmentally friendly as possible, we look at the existing system to see what can be reused and saved from the original critical power installation. This can include switchgear, mains cabling and even the existing battery set. If there is an existing UPS maintenance bypass switch we may be able to use this and prevent or reduce datacentre downtime when the new UPS system is installed. We may be able to reconfigure an existing battery set to operate with a new UPS system’s DC voltage range. We also of course provide a complete energy efficiency comparison to show energy and cooling system savings and cost reductions. This just leaves the old UPS in situ. Yet again the EcoPowerSupplies team provides a solution. We provide a complete UPS disposals service including de-commissioning of the UPS and battery sets, dismantling and removal from site to our recycling centre. Here we complete a full UPS system and battery set strip down to recover as much materials as possible for recycling. The process is fully documented and audited and we also provide clients with waste transfer notes and disposal certificates. Our UPS disposals service can be ordered as a one-off service and does not have to form part of a new UPS installation from EcoPowerSupplies. As well as complete UPS disposals we can also be called upon to provide a UPS relocations as part of our UPS services package. This involves decommissioning the existing system, movement to the new location, commissioning, certification and handover.